Edward Selleck, one of the ten original members of the Amherst Skating Club, was the first person to submit an application to the Amherst Recreation Commission, on August 3, 1964. The stated purpose for applying for the formation of the club was to utilize to the fullest the new ice rink facility, which opened in early 1964, to develop the sport of figure skating among the residents of the Town of Amherst and to become affiliated with the U.S.F.S.A. The first directors meeting took place on December 2, 1966, after several organizational meetings were held to formulate plans for the Club. Vernon Fruehauf was elected President. After one year of the Club's existence, the membership consisted of 120 members. In January 1967, the Club boasted a membership of 200 individual members, of which almost half were children. That same year, the Amherst Skating Club participated in the Town of Amherst Winter Carnival for the first time. The year 1968 brought many changes and growth for the Club under the leadership of Dexter Rosen as Club President. The ASC took part in the First Annual Town of Amherst Championship and later that season, competitors from the Club entered the Greater Buffalo Interclub Competition. During that same year, the Club produced its first major production under the direction of Mrs. Frances Duroure. The familiar emblem of the ASC depicting a skater on a shield bearing the name and initials of the Club was adopted in June of 1968. The First edition of the "Ice Facts" was printed and the Progress Trophy Award was initiated. During the 1969-70 season, the ASC hosted its first Greater Buffalo Interclub Competition. Early in 1970, the Junior Board was formed because of the tremendous interest in club involvement expressed by the young people of our Club.. The 1971-72 season was marked by great expansion as the Club was asked to administer the entire skating program, including the Amherst Town Classes. In January of 1972, the ASC held an Ice Show as part of the Winter Carnival and the Clearfield Rink opened October 6, 1972. 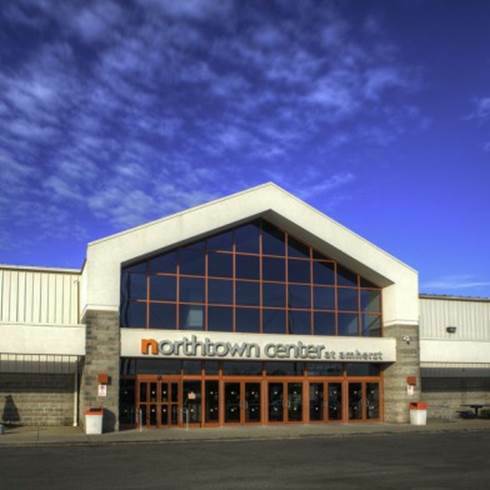 The highlight of the 1973-74 season was hosting the North Atlantic Figure Skating Championships at both rinks. In 1986-87 the ASC hosted its very first Amherst Invitational Competition which drew skaters from Pennsylvania to Toronto. This competition has been an annual event for the Club. In January 1989, there was "standing room only" at the ASC Ice Show and in April, Olympic Gold Medalist Robin Cousins put on a three-day clinic for our skaters. The next few years brought many other internationally known skaters to various club events and seminars, including John Curry, Peter and Kitty Carruthers, Scott Hamilton and the Stars on Ice Cast along with Brian Orser, Rob McCall and Tracy Wilson. Members of the ASC skated with Olympic Gold medalist Brian Boitano in a production entitled "Me & My Shadow" during the opening festivities at the Marine Midland Arena in September 1996. In the fall of 1997, ASC again hosted the North Atlantic Figure Skating Championship held at Niagara University. ASC and other ice user groups collaborated with the Amherst Town Board and the decision was reached by the town to build a new four-rink facility at the site of the old Audubon Rink. In September of 1998, the ASC moved into the Amherst Pepsi Center, one of the largest ice and recreational complexes in the US. Club skaters had the opportunity to skate with Brian Orser at the center's gala opening ceremonies. ASC proudly hosted the 2000 Junior National Figure Skating Championships and the 2001, 2005, 2008, 2012 and 2017 North Atlantic Regional Championships. ASC is constantly growing and changing to meet the needs of our skating community. Our rinks are in operation all year long adding continuity to our programs. We include a very talented and dedicated group of professionals that strive to foster a love of skating among our members.